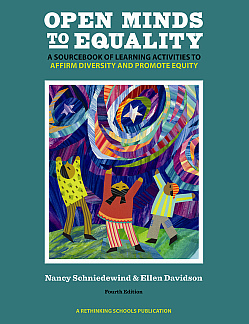 Open Minds to Equality is an educator’s sourcebook of activities to help students understand and change inequalities based on race, gender, class, age, language, sexual orientation, physical/mental ability, and religion. The activities also promote respect for diversity and interpersonal equality among students, fostering a classroom that is participatory, cooperative, and democratic. Learning activities are sequenced to build awareness and understanding. This book is an essential resource for teachers, leaders in professional development, and curriculum specialists. This fourth edition of Open Minds to Equality contains a wealth of updated information and resources. New lessons address immigration, anti-Muslim discrimination, gender identity, and bullying. The comprehensive, annotated bibliography has been revised and updated.